According to the UK Memorials people this plaque was not the original. This is the record on their site. "DATE UNKNOWN: ORIGINAL DEDICATORY BRONZE PLAQUE WAS STOLEN. IT WAS LATER FOUND IN A SCRAP MERCHANT'S YARD BUT IT WAS DAMAGED BEYONE REPAIR SO A NEW STONE TABLET WAS PLACED IN THE GARDEN INSTEAD." Tottington village is to the right. The Restaurant on the corner was known as the "Printers Arms". I spent many happy years playing in these gardens. I really did not understand why my mother and Grandmother were reasonably OK about it. It does not seem a sad place - more a timeless place. Found some more information the BBC website is here but I have Copied and Pasted too. The survivors of a flying bomb attack on a village during World War Two were due to take part in a service on Christmas Eve to remember those killed. Six people died when the V1 rocket - also known as a doodlebug - landed on Chapel Street, in Tottington, near Bury, Greater Manchester, 60 years ago. The German rocket destroyed a row of cottages and was one of 15 bombs to fall near Manchester on that day. 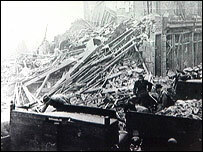 The service will be held at memorial gardens built where the bomb landed. Colin MacDonald, who was aged 14 at the time, said he felt lucky to be alive. He said: "I just woke up with a tremendous bang and the ceiling coming in on top of the bed. There was a mad scramble to get out. "We didn't know what happened. We thought it might be a gas explosion. None of us thought it would be a bomb or a flying bomb. "Then we got out and all the backs of the houses were down and there was a crater, 30ft deep, and all the windows were out. There was glass from kerb to kerb." The attack was the second worst of the day. The worst was in Abbey Hills Road, in Oldham, where a V1 landed on a row of cottages, killing 27 people and seriously injuring 49. In total, 45 rockets were launched by the Nazis on that day, 31 of which reached the UK. This is the link to the Flickr site. I did not have this supplementary information either. 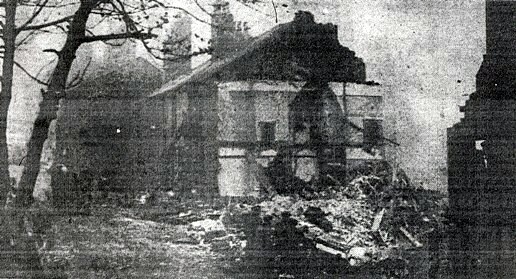 V1 flying bomb site, Chapel Street, Tottington near Bury. At just before 6 o'clock on the morning of Christmas Eve 1944, 6 people in the village of Tottington were killed when a V1 flying bomb dived into a row of terraced houses. 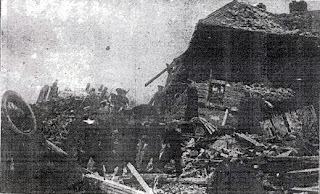 A further 9 people were injured, one of whom died later of injuries. This photo was taken across the road from the bomb site, upon which there is now this memorial plaque and garden. British civilians in the Summer of 1944 probably thought that following the Normandy invasion, the horrors of war on the home front (apart from the fear of a telegram) were nearly over. But 3 years after the Blitz, cruise missiles and rockets appeared in the skies, bringing terror without warning. V1's were pulsejet propelled missiles, usually launched from ramps in Northern France and Holland against London and the South East. However, on Christmas Eve 1944, 45 Doodlebugs were launched from underneath adapted Heinkel He111 bombers flying over the North Sea, because the launch sites in Europe had been overrun by the Allies. The bombers released the V1s aimed at Manchester, then turned back to base. Many of the missiles landed harmlessly; the worst was at Abbey Hills Road in Oldham, where 32 people were killed. An unintentional feature of the bomb was that as the timer counted down to the designated moment, the engine would cut and the thing would dive to the ground. People learned to listen to the engine, and knew that when it cut they had just a few seconds to take cover. The Nazis overcame this flaw so that later models went into a powered dive giving no warning at all. But then shortly after that, V2 rockets came tearing out of the stratosphere at 4 times the speed of sound... As newly arriving American servicemen were reminded, Great Britain was a war zone. Mr Nicholas Conway (50) and Mrs Mary Ann Conway (48). They were at number 19 Chapel Street. Miss Annie Greenhalgh (75 ). 21 Chapel Street. Elizabeth Hodgkinson Draper, (about 55). 31 Chapel Street. Mr James Dyson (52) and Mrs Teresa Dyson, visiting from Bulwell, Nottingham, at 33 Chapel Street. I am also including the 2 photos from the Bolton Evening News.I am indebted to Lancsman who clearly has done much spadework here Here is a link back to his site. Here is a link to the pictures of Tottington Dungeon. The dungeon is only 100 yards from the Whitehead Gardens.